At first when I put the LEDs in the no. plate, they were flickering and were emitting very dim light. So I thought oh bugger, faulty leds... but when I took the LEFT led out and put the halogen back in, the RIGHT led started to work fine.... so I then put the led back in the LEFT socket and both worked fine... until I switched off my lights and put them back on.. and now they were both flickering again. If I leave one LED and one Halogen bulb on the number plate and side lights.. then when turning my lights on and off all bulbs work fine.. but obviously I dont want to drive around with half of my car in LED and half as halogen haha... Any idea what the problem is? 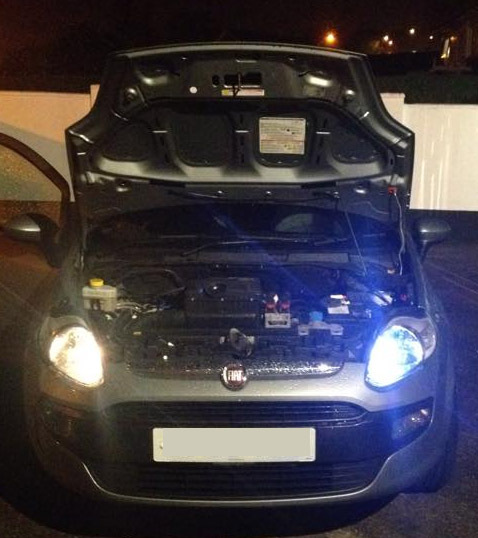 Owner of a 2010 Punto Evo Dynamic - 1.4 8v // Modifications: Tinted windows, 17inch Alloy Wheels, Sprayed breaks, Lights converted to LED etc. Any reputable websites or any good deals you know of btw? Watch for "Canbus ready" in the description though...! All car led lighting is made in and comes from China, so why not buy them directly from their scource...?? For the license plate lighting: find a 2 led bulb that fits, too much light there looks bad imo. Last edited by Peter Pick-Up; 30-10-2014 at 16:19.